A nine pack of Catonsville Gourmet’s famous lump 5 ounce crabcakes. 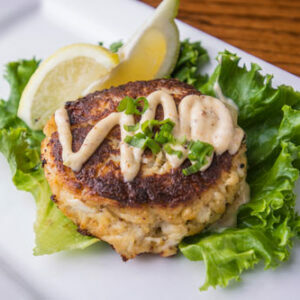 The Perfect Maryland Style Crab Cakes Hand made from All Lump Domestic Blue Crab with just the right amount of Chesapeake Bay flavoring, exactly like the Crab cakes you enjoyed as a child. Made daily by Chef Rob Rehmert from a family recipe and sold at Local Farmers Markets through-out the greater Baltimore area since 1997. Sold Exclusively at the Catonsville Gourmet since 2008 at the Retail Market and at the Restaurant. And “Now”, We can ship to your Family and Friends anywhere in the U.S.A. with the use of Our secured Internet Online Store! 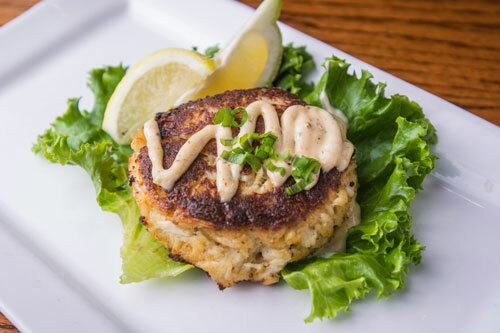 Our Gourmet Crab Cakes make the perfect Gift Idea for the Holidays, Special Occasions or your party needs! Remove lid from the styro foam Crab Cake Container and quickly flip the container over on a flat greased sheet pan. Slowly lift the container off the Crab Cake. This will help to form a ready to eat Crab Cake. Place the sheet pan with the crab Cakes in the preheated oven for 12-15 minutes or until the Crab Cakes are golden brown and firm. Remove from the oven and let the Crab Cakes set for 2- 3 minutes before serving. ENJOY! BON APPETITE! BIEN VENIEDO!